Dialysis is a treatment designed to help the body function naturally when kidneys no longer function on their own. When kidneys no longer hold the ability to function innately, your body enters into End Stage Renal Disease (ESRD). When Do You Need Dialysis Treatment? There are several signs to determine when you should start receiving dialysis treatment. When kidneys begin to fail, the waste in your body will increase, causing you to become ill. Doctors will typically measure your creatinine level and blood urea nitrogen level to decide when and how to start you on dialysis treatments. If you have not yet discussed the possibility of kidney failure, or ESRD, with your doctor, you may experience some symptoms that help determine if you should seek further health care. If you find that you are experiencing these symptoms, contact your physician immediately, to avoid additional damage to your system. You know what dialysis is and how to tell if it may be a concern for you, but what causes end stage renal disease? Diabetes and hypertension are two of the most popular causes of ESRD. If you have been diagnosed with either diabetes or hypertension, and have experienced some of the above symptoms, the possibility of end stage renal disease increases. Choosing to undergo dialysis treatments to help with your kidney function is a big step in the right direction. Dialysis treatments can seem complicated with some uncertainties, but the process is actually quite simple. There are two types of dialysis treatments: hemodialysis and peritoneal dialysis. In the hemodialysis treatment, blood will pass from the patient’s body, through a dialysis machine and a filter, then back into the patient. In some cases, the hemodialysis catheter may be placed into a large vein in the neck, or in the leg to perform the treatment. Hemodialysis typically takes place in a hemodialysis building, with several dialysis machines. These units may also offer dietary counseling to a patient seeking additional help. Usually, patients will attend treatment appointments several times per week, alternating days. Each treatment lasts a few hours, depending on the severity and patient’s body. In some cases, patients may be able to perform hemodialysis treatments at home. With peritoneal dialysis, a plastic tube is inserted into the abdominal region. A special fluid is then inserted to flush out excess waste from the body. This special fluid is referred to as ‘dialysate’. Dialysate is inserted into the stomach cavity, and flushes out the intestines. This treatment also uses the patient’s body tissue to act as the filter for the fluids. Peritoneal dialysis may be required several times per week, and can possibly require administering a few times each day. Choosing peritoneal dialysis gives you a bit more independence, as it can be done at home. However, patients who choose this treatment may be more exposed to the possibility of infection. Medicare will usually end up covering most treatments that involve end stage renal disease and kidney failure. Original medicare will pay for some of the cost, and you will pay the rest, depending on the treatment that you seek. You may also be eligible for Medicare if you’re under 65 with end stage renal disease. There may also be other opportunities to qualify for Medicare before the age of 65 with end stage renal disease. For more information, contact us today to speak to one of our agents. The cost and coverage of your dialysis treatment is partially dependent on where your treatment takes place. This can be broken down into three different treatment plans. Inpatient Dialysis: As long as you receive treatment from a Medicare-approved facility, Part A will cover the cost of an inpatient kidney transplant and dialysis. Part B will cover fees for surgeons, and other medical physicians, but you will still be responsible for a 20% coinsurance. It is important to note, Medicare also pays for your kidney donors hospital expenses, without charging you any additional costs. Outpatient Dialysis: Medicare Part B covers dialysis if you receive routine maintenance dialysis and receive the dialysis treatment from a Medicare-approved dialysis facility. Like inpatient dialysis, you will typically pay for a 20% coinsurance. You will also be billed separately for certain doctor fees. 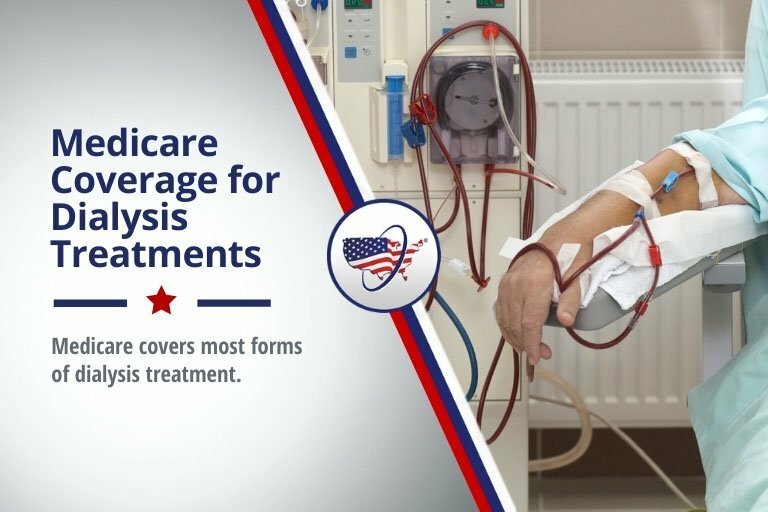 Home Dialysis: Part B of Medicare will pay for certified training from a doctor or facility that teaches you how to conduct your own treatments. As with inpatient dialysis and outpatient dialysis, you will usually pay for a 20% coinsurance. Please remember, Medicare will not cover services that are required to prepare you for any dialysis treatments before you are eligible for Medicare. If you are someone you know is reaching the age of Medicare, we encourage you to call us today. One of our agents would be happy to talk to you about your options! You can also compare plans and rates using our online form here. If you are under the age of 65, but are experiencing end stage renal disease, you may be eligible to enroll in Medicare. To check your options with Medicare, contact us, and we will get you on the right path to start receiving coverage.